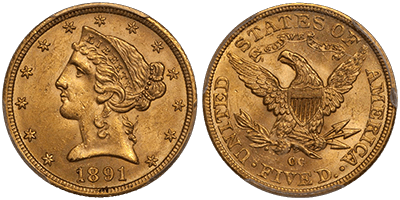 The task of uncovering rare U.S. gold coins with both a unique story and superior quality is a challenging one—and some coins make an expert’s task all the more demanding. Some can even take as much as a year or more to source! The U.S. gold we have available today is one such example. Sourced from around the country, these gold coins are available in graded pieces with total populations of likely 10 or fewer—worldwide. Coins like this simply don’t appear on the market on a regular basis, and once they are sold, they tend to disappear in collections for years if not decades. The U.S. gold available today was hand-selected by our rare coin expert, and, due to its rarity and exceptional quality, represents the “Best of 2017,” so to speak. 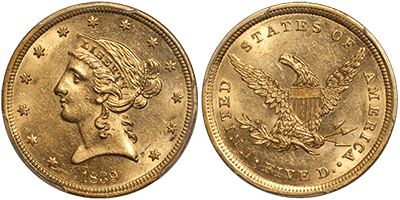 Each is a CAC-approved gold coin that is one of the finest in its type and grade, and all exhibit exceptional coloring and overall condition. In fact, one of the coins available today has potential to be part of a world-class collection of Carson City Double Eagles. To secure these “2017 essentials” while they’re available, please call us at 800-831-0007. 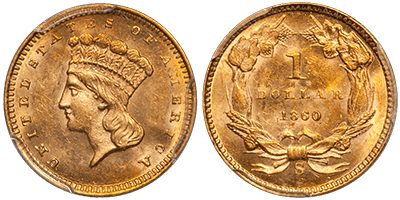 The 1860-S is one of just five Type Three gold dollars from the San Francisco Mint. Only 13,000 were made, and it is likely that around 200 exist in total. This is a scarce issue in Uncirculated, with most known specimens available in the MS60 to MS62 range. There are an estimated four or five properly graded MS63s, plus another two or three MS64s. The sole Gem is the Duckor-Vasquez Rocks PCGS MS65, which brought $31,725 at the Heritage 2015 ANA: 4260. This choice example is notable for its rich, satiny mint luster and is accentuated by splashes of reddish-gold on the obverse periphery. It is well-struck and clean with just a few luster grazes seen in the left obverse field. A little roughness in the planchet is visible to the right of the value; however, this feature is mint-made. Only one PCGS MS63 has sold at auction since early 2008, and it was a non-CAC piece with distinct coloring that brought $5,170 at the Heritage 2017 Florida United Numismatists (FUN) Show: Lot 6549. This date is essentially unavailable in finer grades, and this piece makes an excellent addition to a high-end gold dollar set. CAC has approved four in MS63 with just one finer (MS65). While common in circulated grades and sometimes available in the lower Uncirculated grades, the 1838 is rare in properly graded MS63 and almost impossible to locate finer than this. The finest known—by a large margin—is the superb PCGS MS67, which brought $235,000 at Pogue II: Lot 2065. This fresh-to-the-market example is struck in rich yellow-gold and exhibits strong mint frost on both the obverse and the reverse. It is far better struck than normal for this design type. The coin displays just a bit of weakness at the centers, and the fields show minor scuffs consistent with the assigned grade. No MS63 1838 Quarter Eagle from either service has been auctioned since August 2002, and the last PCGS MS64 crossed the block in 2004. An NGC MS64 coin of comparable quality was auctioned at Stacks Bowers 3/17: Lot 3098. It sold at PCGS/CAC for $14,100. Collecting Classic Head Quarter Eagles by date has become very popular among investors, and if you are working on a high-grade set, you know how difficult it is to locate an 1838 of this quality. CAC has approved five in this grade with none finer. 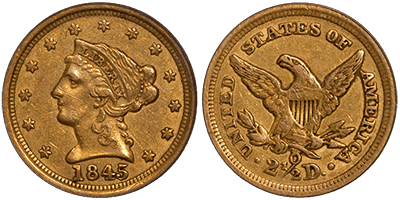 The 1845-O is by far the single rarest Quarter Eagle from New Orleans—only 4,000 were made, with well under 100 in existence. This issue is rare in properly graded AU53 to AU55, and it is almost never seen above this range. This is an exceptional coin with enough detail and skin to get serious consideration as an AU55. 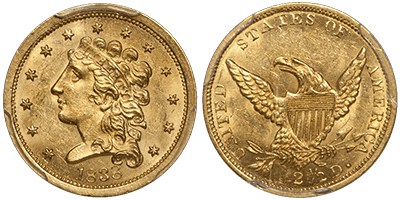 It is a bit soft on the high spots (as are most 1845-O Quarter Eagles), but has a pleasing natural green-gold color with ample underlying natural mint luster. There are shallow mint-made depressions on both sides, but these are well-hidden by the depth of the color and can be missed if unmentioned. Overall, this is a really cosmetic example of a rare, popular issue that is seldom available in this quality. The last CAC-approved AU53 1845-O Quarter Eagle to sell at auction was an NGC piece offered at Bowers and Merena 1/11: Lot 1337, which realized $8,165. Two PCGS AU53s have sold at auction since 2000, and both were low-end non-CAC pieces—these realized $7,931 in January 2013 and $8,050 in October 2011. This is just about the best available quality for this in-demand issue, and it makes a great addition to an important New Orleans gold collection. CAC has approved three in this grade with eight finer. All 1839-dated Half Eagles are distinct one-year types with a unique portrait of Liberty and, in the case of the 1839-C and 1839-D issues, the mintmark on the obverse. The 1839 Philadelphia Half Eagle is rare in Uncirculated with around 10 or so known, mostly in the MS60 to MS62 range. This is an exceptional coin for the grade, with rich, unbroken frost below natural light orange-gold color. The strike is razor sharp with 100% full hair and feathers, and the surfaces show just a few small ticks, most notably right behind the back of Liberty’s neck. No PCGS MS62 1839 Half Eagle has sold at auction since October 2011, when a very nice CAC-approved piece brought a strong $24,150 in a Heritage event. An NGC MS62 with CAC approval brought $17,625 at Heritage 2014: Lot 6627. This is an important coin that should appeal to both the type collector and to the Liberty Head Half Eagle enthusiast. CAC has approved three in this grade with three finer. 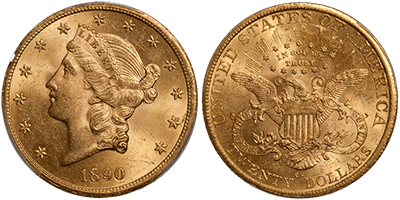 The 1891-CC is by far the most available Carson City Half Eagle in terms of overall and high-grade rarity. It becomes scarce in the MS63 to MS64 range, especially coins that are choice and original. This very choice example is completely original with untouched frosty surfaces that show glowing medium orange-gold hues. There are fewer marks than normal for this issue, and as far as I can tell, the only thing keeping this coin from an MS64 grade is some scuffing in the upper left obverse field. No PCGS MS63+ 1891-CC Half Eagle has sold at auction. The last CAC-approved PCGS MS63 sold for $4,113 at Goldberg 9/17: 1200. This is an exceptional coin that would make the perfect high-grade Carson City Half Eagle type coin for the advanced collector. CAC has approved 34 in MS63 with 19 finer. As with all of the comparatively available Type Three issues from this Mint, the 1890-CC Double Eagle is rare in properly graded MS62 and virtually unavailable finer. This coin is nice enough that I tried it against a number of coins for an MS63 grade, and it is clearly vastly finer than nearly any CC Double Eagle graded MS62. It is extremely frosty with choice surfaces, rich natural orange-gold color, and a soft rose undertone. There are a few stray contact marks on Liberty’s face that ultimately limit the grade, but these are hard to see without the aid of magnification. No PCGS MS62+ 1890-CC Double Eagle has ever sold at auction. In fact, the last PCGS MS62 with CAC approval was this exact coin (see below for further provenance). This example is destined for a world-class collection of Carson City Double Eagles. CAC has approved 12 in MS62 (with at least one in MS62+) with just one finer (MS63). This selection of rare U.S. gold is the perfect example of coins that only present themselves in the market for a very brief period. They were meticulously sought out to give ASI readers a unique set of some of 2017’s choicest rare coins. Sourced from all over the country, these one-of-a-kind graded pieces are the type of investments that paint a unique picture of the past. Unlike stocks, these coins have a history and amount to more than a piece of paper. To secure any of these coins while they’re available, please call us at 800-831-0007 or email us. *Prices subject to change based on market fluctuation and product availability. Prices reflected are for cash, check, or bank wire. Offer expires Friday, December 22, 2017, or while supplies last.